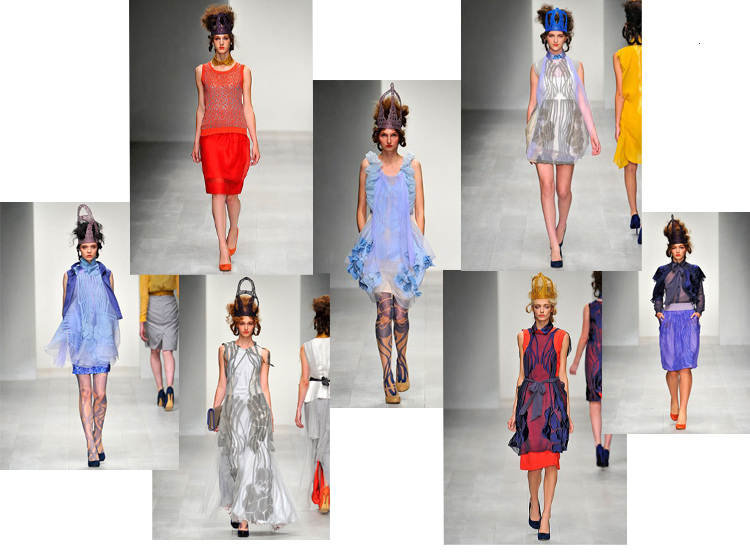 There’s a reason why Bora Aksu is one of the most watched designers emerging from London today. Adhering strictly to Louise Wilson’s, the fearsome head of the MA programme at Central St Martins, from which Aksu graduated in 2002, central mantra against derivativeness, this season the Turkish designer has produced yet another starkly original collection to add to his impressive legacy. Describing his work as ‘demi-couture’, for Spring/ Summer 13 Aksu has produced a collection which focuses upon the point at which sweet romanticism collides with a darker edge; he calls upon Queen Marie of Romania, the grand-daughter of Queen Victoria, to be his central muse. Torn from her British roots by her marriage to Ferdinand of Romania, Queen Maria embraced Romanian culture and traditions whilst still maintaining her quintessential Englishness. This can be witnessed literally through Aksu’s frequent depiction of traditionally shaped, gauzy puffed sleeves and heavier dirndl skirts in the collection, and more metaphorically with his melding of fabric and prints. The layering of tulle over cotton and silk embossed with abstract prints give an ephemeral, trompe l’oeil effect to the garments, speaking of a life full of uncertainties and layered with different experiences. In fact, the meaning of the repeated print flows with the bias cut fabrics; occasionally floral, sometimes almost artery-like as it curves with the models’ bodies, it ties a sense of displacement in with a distinct celebration of the ornate and beautiful. Apart from the inspiration aspect of this collection, Aksu additionally displays an innovative approach to cut, utilising the build-up of the aforementioned separate layers to combine into translucent silken waterfalls of dresses, ideal for summer wafting. Furthermore, inserts of ruched chiffon brought low-key dynamism and shaping to some dresses, whereas shots of embroidered collars, lapels, belts and the occasional knitted vest grounded others sections of the collection. The last thing to mention is, of course, the crocheted crowns worn by each model that strutted down the catwalk. Made by Aksu to compliment the inspiration behind the Spring/ Summer ’13 collection, they were the perfect, unique accessorised the romantic but yet slightly gothic feel to the clothes on display. As always, Bora Aksu is anything but derivative.